Canadian subscribers please click here. International subscribers please click here. 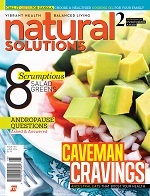 Natural Solutions may contact me regarding special promotions and events. *Rate valid in the U.S. only. Subscription rates for Canada and International: 1 year for $19.95. Natural Solutions is published ten times a year.